Berwyn, PA –April 17, 2019 – Triumph Group, Inc. (NYSE: TGI) will release fourth quarter fiscal year 2019 earnings on May 8, 2019 and will host a conference call that day at 8:30 a.m. ET. A slide presentation will be included with the audio portion of the webcast. BERWYN, Pa. – April 10, 2019 – Triumph Group, Inc. (NYSE: TGI) announced today at the MRO Americas industry show that its Product Support business unit was selected by a leading regional U.S. airline to provide maintenance, repair and overhaul (MRO) services on heat transfer units for their carrier’s fleet. Under the new arrangement, Triumph Accessory Services in Wellington, Kansas will provide heat exchanger maintenance and repair support for the airline’s fleet of regional jet aircraft. Triumph Accessory Services is an operating company of Triumph Product support. BERWYN, Pa. – April 9, 2019 -- Triumph Group, Inc. (NYSE:TGI) announced at MRO Americas industry show that its Accessory Services business has entered into a five year channel partnership with Honeywell that includes access to spare parts and intellectual property, and positions Triumph as an authorized repair center for Honeywell. As an authorized repair center, Triumph Accessory Services will provide Honeywell and our global customers with support for accessories and component MRO along with supply chain solutions. Triumph Accessory Services is an operating company of Triumph Product Support. BERWYN, Pa. – April 4, 2019 – Triumph Group [NYSE:TGI] has been awarded a contract by The Boeing Company to supply critical hydraulic system components for the MQ-25 unmanned aerial refueling program. BERWYN, Pa. – April 3, 2019 -- Triumph Group, Inc. (NYSE:TGI) announced today that its Aerospace Structures business unit executed an agreement with its customer, Israel Aerospace Industries, Ltd. (IAI) for the transition of the manufacture of wings for the G280 aircraft. BERWYN, Pa. – April 2, 2019 -- Triumph Group, Inc. (NYSE:TGI) announced today that its Aerospace Structures business unit entered a definitive agreement to assign the contract for the manufacture of structural components for the Embraer E2 program to AeroSpace Technologies of Korea Inc. (ASTK). BERWYN, Pa. – March 6, 2019-- Triumph Group, Inc. (NYSE:TGI) announced today the sale of Triumph Aviation Services – NAAS Division, Inc. (“NAAS”) to STS Aviation Group. The transaction is effective as of March 6, 2019. The division generated revenues of approximately $30 million in Triumph Group’s 2018 fiscal year, ending on March 31, 2018. BERWYN, Pa. – March 5, 2019 – Triumph Group, Inc. (NYSE:TGI) announced today that its southeast Asian businesses, Triumph Aviation Services Asia (TASA) and Triumph Structures - Thailand (TST), have signed a comprehensive Memorandum of Understanding (MOU) with Thailand Civil Aviation Training Center (CATC), to work together to foster professional development of aviation talent in Thailand. BERWYN, Pa. – February 21, 2019 – Triumph Group, Inc. (NYSE:TGI) today announced that its Board of Directors has declared a regular quarterly dividend of $0.04 per share on its outstanding common stock. BERWYN, Pa. – February 7, 2019 – Triumph Group, Inc. (NYSE: TGI) (“Triumph” or the “Company”) today reported financial results for its third quarter of fiscal year 2019, which ended December 31, 2018. BERWYN, Pa. – February 6, 2019 -- Triumph Group, Inc. (NYSE:TGI) announced today that it has completed the transfer of the Global 7500 wing manufacturing operations and assets to Bombardier (TSX:BBD.B), as previously announced. BERWYN, Pa. – February 5, 2019 – Triumph Group, Inc. (NYSE:TGI) announced today that its Product Support business unit was selected by a major U.S. airline to provide maintenance, repair and overhaul (MRO) services on heat transfer units for the carrier’s fleet. Under the new arrangement, the Wellington, Kansas based Triumph Accessory Services business will provide heat exchanger maintenance and repair support for the airline’s entire fleet of Airbus and Boeing aircraft. BERWYN, Pa. – January 31, 2019 -- Triumph Group, Inc. (NYSE:TGI) announced today that it will provide Airframe Mounted Accessory Drives (AMAD) and hydraulic systems to Saab for the Boeing T-X advanced pilot training jet. 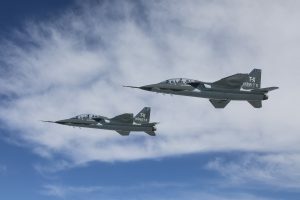 Saab, Boeing’s partner for the T-X program, responsible for the aft fuselage and the associated subsystems, named Triumph as the supplier to design, develop, manufacture, and provide aftermarket support for the AMAD and hydraulic systems. BERWYN, Pa. – Jan. 28, 2019-- Triumph Group, Inc. (NYSE:TGI) announced today a definitive agreement to sell Triumph Fabrications to Arlington Capital Partners. The operations included in the agreement are in Fort Worth, Texas; Hot Springs, Arkansas; Phoenix, Arizona; San Diego, California; and Shelbyville, Indiana. BERWYN, Pa. – Jan. 24, 2019-- Triumph Group, Inc. (NYSE:TGI) announced today a definitive agreement to sell its metallics machining operations to NWI Holdings, an affiliate of TECT Aerospace and TECT Power. TECT Aerospace manufactures complex aerostructure components, parts and assemblies from the full spectrum of traditional and aerospace alloys, and is headquartered in Wichita, Kansas. TECT Power, headquartered in Fort Mitchell, KY, is a leading provider of complex rotating and structural airfoil components for turbine engines used in commercial aerospace, business jet, defense and industrial markets. BERWYN, Pa.– Jan. 24, 2019 -- Triumph Group, Inc. (NYSE:TGI) announced today that it has entered into a definitive agreement to transfer the Global 7500 program (the ”transition” or “agreement”) to Bombardier (TSX:BBD.B). Under the terms of the agreement, Triumph will transition responsibility for the Global 7500 wing manufacturing operations and assets to Bombardier. – Triumph Group, Inc. (NYSE: TGI) will release third quarter fiscal year 2019 earnings on February 7, 2019 and will host a conference call that day at 8:30 a.m. ET. A slide presentation will be included with the audio portion of the webcast. BERWYN, Pa. – January 16, 2019 -- Triumph Group, Inc. (NYSE: TGI) announced today that its Integrated Systems business unit will provide nacelle components for Bombardier Belfast in support of their thrust reverser units for the Geared Turbo Fan powered A320neo aircraft. Under the agreement Triumph will design, qualify and manufacture cowl opening actuation systems and hold-open rods. BERWYN, Pa. – Jan. 16, 2019 – The U.S. Air Force has accepted the first Boeing KC-46A Pegasus tanker aircraft, setting the stage for the aircraft’s delivery to McConnell Air Force Base, in Wichita, Kansas in the coming weeks. Triumph Group [NYSE:TGI] is a strategic supplier to Boeing on major structures including horizontal stabilizers, doors, aft fuselage and center wing sections of the tanker. Triumph also provides products for the aircraft both directly and indirectly to Boeing, including the air drive unit. BERWYN, Pa. – Jan. 14, 2019 -- Triumph Group, Inc. (NYSE: TGI) announced today that it will provide structural formed skins for the Bombardier thrust reversers to be fitted on Geared Turbo Fan powered A320neo aircraft. Under the contract Triumph will work with Bombardier Belfast to support the production of the newly designed thrust reversers as it completes the initial phases of design and test, and on through the full program lifecycle. BERWYN, Pa. – January 10, 2019 – Triumph Group, Inc. (NYSE:TGI) announced today that it has completed the previously announced sale of it APU Repair Product Line (RPL) of Triumph Aviation Services Asia, Ltd. (TASA). BERWYN, Pa. – November 15, 2018 – Triumph Group, Inc. (NYSE:TGI) today announced that its Board of Directors has declared a regular quarterly dividend of $0.04 per share on its outstanding common stock. The dividend is payable December 15, 2018 to shareholders of record as of November 30, 2018. BERWYN, Pa. – November 8, 2018 – Triumph Group, Inc. (NYSE: TGI) (“Triumph” or the “Company”) today reported financial results for its second quarter of fiscal year 2019, which ended September 30, 2018. BERWYN, Pa. – Nov. 6, 2018 -- Triumph Group, Inc. (NYSE:TGI) announced today that its Aerospace Structures business has been selected by Gulfstream to manufacture a new order of fuselage frames for the Gulfstream G500 and Gulfstream G600 aircraft. Under terms of the agreement, which will run through 2020, Triumph Fabrications in Hot Springs, Arkansas will produce the fuselage frames with stretch formed extrusions that will then be machined into final configurations. BERWYN, Pa.--(BUSINESS WIRE)—Nov. 1, 2018-- Triumph Group (NYSE:TGI) today announced that Frank Dubey will join the company as Executive Vice President of its Integrated Systems business unit, effective November 26, 2018. Dubey succeeds Tom Holzthum, who is retiring at the end of the calendar year after a transition period. Dubey will report directly to Triumph Group President and CEO, Dan Crowley. BERWYN, Pa. – Oct. 31, 2018 – Triumph Group, Inc. (NYSE:TGI) announced today that its Integrated Systems business has been selected by Huntington Ingalls Industries to supply remote valve actuation (RMVA) systems as part of the scheduled overhaul of the USS George Washington (CVN73) nuclear powered aircraft carrier. Under terms of the agreement, Triumph’s Mechanical Solutions facility in Shelbyville, Indiana will produce 165 RMVAs for the carrier. Berwyn, PA –October 18, 2018 – Triumph Group, Inc. (NYSE: TGI) will release second quarter fiscal year 2019 earnings on November 8, 2018 and will host a conference call that day at 8:30 a.m. ET. A slide presentation will be included with the audio portion of the webcast. BERWYN, Pa.--(BUSINESS WIRE)--Oct. 11, 2018-- Triumph Group, Inc.(NYSE: TGI) announced today that it was awarded a five-year contract for maintenance, repair and overhaul (MRO) work on CFM56-7B nacelle components for the 737NG aircraft operated by a U.S. airline operator. Under the contract Triumph Product Support will service thrust reversers, fan cowls and inlet cowls on the CFM56-7B engines on the carrier’s 737NG fleet. BERWYN, Pa.--(BUSINESS WIRE)—September 24, 2018-- Triumph Group (NYSE:TGI) today announced that Jennifer Allen will join the company as Senior Vice President and General Counsel, reporting to President and CEO Daniel Crowley. Ms. Allen will also serve as Secretary for the company and oversee activities related to the Board of Directors. BERWYN, Pa. – September 10, 2018 – Triumph Group, Inc. (NYSE:TGI) announced today that it was awarded two contract extensions from General Dynamics Ordnance and Tactical Systems for the production of specially machined guided missile parts. The contracts, which are expected to generate sales totaling more than $11 million, are for machining and forging of parts and components on the Lockheed Martin HELLFIRE Romeo guided missile systems. The production will take place at the Triumph Aerospace Structures’ specialty machining facility in Albany, Oregon. BERWYN, Pa.--(BUSINESS WIRE)—September 10, 2018-- Triumph Group (NYSE:TGI) today announced that William Kircher will join the company as Executive Vice President of its Product Support business unit. Kircher replaces Mike Abram who will retire at the end of the calendar year. Kircher brings more than 20 years of executive experience with demonstrated achievement in leading multinational businesses in the aerospace repair and services market. BERWYN, Pa.--(BUSINESS WIRE)— August 14, 2018-- Triumph Group, Inc. (NYSE: TGI) announced that its subsidiary, Triumph Aviation Services Asia, Ltd., has been selected by Asiana Airlines Inc. to provide CF6-80C2 thrust reverser maintenance support and services for its fleet of Boeing 747-400 and 767-300. Triumph Aviation Services Asia is an operating company of Triumph Product Support. BERWYN, Pa. – August 8, 2018 – Triumph Group, Inc. (NYSE: TGI) (“Triumph” or the “Company”) today reported financial results for its first quarter of fiscal year 2019, which ended June 30, 2018. BERWYN, Pa. – August 7, 2018 – Triumph Group, Inc. (NYSE:TGI) announced today that its Aerospace Structures business has been awarded a multi-year airframe component contract for Lockheed Martin’s C130J Super Hercules program. Under initial terms of the contract, Triumph Fabrications in San Diego, California will provide 108 different part numbers for the C130J program. The parts include fabricated sheet metal structures made from a combination of aluminum, steel and titanium materials that will be fitted to the nacelle, wing and fuselage sections of the aircraft. BERWYN, Pa. – August 7, 2018 – Triumph Group, Inc. (NYSE:TGI) today announced that its Board of Directors has declared a regular quarterly dividend of $0.04 per share on its outstanding common stock. The dividend is payable September 15, 2018 to shareholders of record as of August 31, 2018. BERWYN, Pa. –August 3, 2018 – Triumph Group, Inc. (NYSE:TGI) announced today that its Aerospace Structures Fabrication facility located in Hot Springs, Arkansas received a contract extension from Lockheed Martin to continue supplying titanium hot form machined exhaust screens for use on the F-35 blocker doors. BERWYN, Pa. – August 1, 2018 – Triumph Group, Inc. (NYSE:TGI) announced today the sale of Triumph Structures – East Texas, Inc. to Merritt Preferred Components. The transaction was effective July 31, 2018. The East Texas division generated revenues of approximately $20 million in Triumph Group’s fiscal year ended March 31, 2018. BERWYN, Pa. – July 31, 2018 – Triumph Group, Inc. (NYSE: TGI) announced today that it has signed a letter of intent for future collaboration with Quickstep Holdings Limited (ASX:QHL), Australia’s leading independent manufacturer of advanced carbon fiber composite components. FARNBOROUGH, United Kingdom – July 16, 2018 -- Triumph Group, Inc. (NYSE:TGI) announced today that it was selected by Saab to provide Airframe Mounted Accessory Drives (AMAD) for Gripen E/F single-engine multirole fighter aircraft. Triumph Integrated Systems will design, develop, manufacture, and provide aftermarket support for the AMAD for the life of the aircraft program. FARNBOROUGH, United Kingdom – July 16, 2018 – Triumph Group, Inc. (NYSE:TGI) (“Triumph” or the “Company”) is proud to kick off its 25th anniversary year celebration at the 2018 Farnborough Airshow. Since its founding on July 22, 1993, Triumph has built a reputation as a trusted partner to the world’s leading aerospace OEMs, with an expansive range of capabilities and services for the aircraft, aerospace and defense industries at any stage of the aircraft lifecycle. Berwyn, PA –July 13, 2018 – Triumph Group, Inc. (NYSE: TGI) will release first quarter fiscal year 2019 earnings on August 8, 2018 and will host a conference call that day at 8:30 a.m. ET. A slide presentation will be included with the audio portion of the webcast. As previously announced in May 2016, Triumph Group is undergoing a transformation to proactively position the company for long-term success and enhance the company’s performance and competitiveness in the marketplace. BERWYN, Pa.--(BUSINESS WIRE)—June 28, 2018 -- Triumph Group, Inc. (NYSE: TGI) announced its Triumph Airborne Structures maintenance, repair, and overhaul business was awarded a three-year contract to provide engine nacelle component repair and materials services for an unspecified military cargo aircraft. BERWYN, Pa. – April 10, 2018 – Triumph Group, Inc. (NYSE:TGI) announced today that it has reached agreements for divestiture of three businesses in alignment with the company’s transformation strategy to reshape its portfolio to focus on businesses that best fit the strategic direction of the company. BERWYN, Pa. – May 07, 2018 –Triumph Group, Inc. (NYSE:TGI) announced today that for the second time in the last three years, its Geared Solutions business has been recognized by Lockheed Martin’s Rotary and Mission Systems (RMS) as Supplier of the Year for exceptional performance and contributions to its Sikorsky helicopter company. The Park City, Utah based Geared Solutions business took this year’s honor for their development work on the S-97 Raider® gearbox. BERWYN, Pa. – April 25, 2018 – Triumph Group, Inc. (NYSE:TGI) announced today that it has reached an agreement with Boeing to extend its current long-term agreement to supply composite detail and assembly parts for the Boeing 787 Dreamliner. Under the agreement, Triumph Aerospace Structures’ business based out of Milledgeville, Georgia will continue production of composite parts for the 787, section 47/48 fuselage to be shipped directly to Boeing’s North Charleston, South Carolina facility for integration into the aft body section of the airplane. Berwyn, PA – April 24, 2018 – Triumph Group, Inc. (NYSE: TGI) will release fourth quarter and fiscal year 2018 earnings on May 10, 2018 and will host a conference call that day at 8:30 a.m. ET. A slide presentation will be included with the audio portion of the webcast. BERWYN, Pa. – April 23, 2018 – Triumph Group, Inc. (NYSE:TGI) today announced that its Board of Directors has declared a regular quarterly dividend of $0.04 per share on its outstanding common stock. The dividend is payable June 15, 2018 to shareholders of record as of June 1, 2018. BERWYN, Pa. – April 10, 2018 – Triumph Group, Inc. (NYSE:TGI) announced today that its Grand Prairie, TX based Product Support business has extended a long-term agreement with Pratt & Whitney for engine Line Replaceable Unit (LRU) repairs. Under the agreement, Triumph Product Support’s Accessory Services business based out of Grand Prairie, Texas will service LRUs for the V2500, PW2000 and PW4000 engine models through 2019. The work will originate from global Pratt & Whitney engine shops. BERWYN, Pa. – February 6, 2018 – Triumph Group, Inc. (NYSE: TGI) today announced that its CEO, Dan Crowley, will present at Cowen's 39th Annual Aerospace/Defense & Industrials Conference on Thursday, February 8, 2018 at 11:30 am ET at The Lotte New York Palace Hotel in New York. BERWYN, Pa. – March 19, 2018 –Triumph Group, Inc. (NYSE:TGI) announced today that its Triumph Fabrications company located in Hot Springs, Arkansas was recognized by Lockheed Martin Rotary and Mission Systems (RMS) for exceptional supplier performance in support of their Sikorsky Aircraft business. Triumph Fabrications achieved RMS Elite Supplier status after demonstrated improvements in both quality and delivery performance. Triumph Fabrications, a Triumph Aerospace Structures operating company, produces complex hydroform and stretchform sheet metal components for Sikorsky’s UH-60 Black Hawk platform. BERWYN, Pa. – March 8, 2018 – Triumph Group, Inc. (NYSE: TGI) today announced that its CEO, Dan Crowley, will present at J.P. Morgan's 2018 Aviation, Transportation and Industrials Conference on Tuesday, March 13, 2018 at 1:00 pm ET at the J.P. Morgan office in New York City. BERWYN, Pa.-- February 7, 2018-- Triumph Group, Inc. (NYSE: TGI) announced its subsidiary, Triumph Aviation Services Asia, Ltd., has been selected by Boeing to provide aftermarket support in the Asia Pacific region for their flight controls and engine nacelles program, as well as thrust reverser service for the regional fleet of 777 airplanes. Triumph Aviation Services Asia is an operating company of Triumph Product Support. SINGAPORE AIRSHOW--(BUSINESS WIRE)—February 07, 2018-- Triumph Group, Inc. (NYSE: TGI) announced today its subsidiary, Triumph Aviation Services Asia, Ltd., has signed a memorandum of understanding (MOU) with China Southern Airlines to cooperate in a comprehensive alliance for nacelle maintenance, potentially including the establishment of a joint venture entity in Shenyang, China. Triumph Aviation Services Asia, is an operating company of Triumph Product Support. BERWYN, Pa. – February 7, 2018 – Triumph Group, Inc. (NYSE:TGI) today announced that its Board of Directors has declared a regular quarterly dividend of $0.04 per share on its outstanding common stock. The dividend is payable March 15, 2018 to shareholders of record as of March 1, 2018. Reaffirms Fiscal Year 2018 Revenue and EPS Guidance and Updates Cash Guidance BERWYN, Pa. – February 1, 2018 – Triumph Group, Inc. (NYSE: TGI) (“Triumph” or the “Company”) today reported financial results for its third quarter of fiscal year 2018, which ended December 31, 2017. BERWYN, Pa.-- January 29, 2018-- Triumph Group, Inc. (NYSE:TGI) announced today its Fabrications business has signed a long-term agreement with Bell Helicopter to extend their production of bonded panel structures for the AH-1Z attack helicopter through 2021. Triumph’s Fabrications business, under its newly realigned Aerospace Structures business unit, will provide the panels for Lots 15-16 under the follow-on contract agreement. The contract between Triumph Fabrications and Bell for the original scope of work was executed in 2012. Triumph Fabrications is an operating company of Triumph Aerospace Structures. BERWYN, Pa. – January 25, 2018 – Triumph Group, Inc. (NYSE:TGI) was recently selected by Boeing to supply highly engineered components used for applications on the 787 Dreamliner and 737 MAX programs. The multiyear contract extends existing work Triumph Mechanical Solutions provides on the 787 program, as well as adds new 737 MAX content. Triumph Mechanical Solutions is an operating company of Triumph Integrated Systems. BERWYN, Pa. – January 22, 2018 – Triumph Group, Inc. (NYSE: TGI) announced it signed an agreement with Boeing (NYSE:BA) to provide major structural assemblies for the 767 program. The work contracted to Triumph Aerospace Structures includes the production of horizontal stabilizers, doors, aft fuselage and center wing sections for both the 767 freighter and KC-46A Tanker variants. BERWYN, Pa.- January 16, 2018 - Triumph Group, Inc. (“Triumph”) (NYSE:TGI) today announced that its Board of Directors has appointed General Larry O. Spencer and Daniel P. Garton to serve as directors. General Spencer’s appointment is effective immediately, and Mr. Garton’s appointment will be effective February 19, 2018. With these additions, Triumph’s board will be expanded to ten members, nine of whom are independent. Mike Abram, Triumph Product Support's executive vice president, spoke with Lee Ann Shay, Aviation Week's chief editor for MRO, about the company’s restructuring, plane-side service expansion and discussions with Boeing in MRO Network's Fast 5 feature. BERWYN, Pa. – January 11, 2018 – Triumph Group, Inc. (NYSE:TGI) announced today that they will partner with AeroSpace Technologies of Korea Inc. (ASTK), a leading provider of aircraft fuselage, precision components and skeletal materials, to build fuselages for Embraer’s second-generation E-Jet aircraft program including the E175-E2, E190-E2 and the E195-E2. The strategic partnership with ASTK will allow Triumph’s Aerospace Structures business unit to dedicate resources to other production programs and capture new development work while fully meeting the quality and delivery needs of the Embraer customer. Berwyn, PA – January 10, 2018 – Triumph Group, Inc. (NYSE: TGI) will release third quarter fiscal year 2018 earnings on February 1, 2018 and will host a conference call that day at 8:30 a.m. ET. A slide presentation will be included with the audio portion of the webcast. BERWYN, Pa. – January 2, 2018 – Triumph Group, Inc. (NYSE:TGI) announced today that its Integrated Systems business unit will provide the landing gear system for the Dream Chaser spacecraft, a reusable, lifting-body vehicle in support of NASA’s Commercial Resupply Services 2 (CRS2) program that will resupply the International Space Station. The contract for work was signed with Sierra Nevada Corporation (SNC), and includes the main and nose landing gear as well as integrated actuation solutions for the landing gear and gear door systems manufactured at Triumph’s Redmond, Washington site. EXTON, Pa.--(BUSINESS WIRE)--Innovative Solutions & Support, Inc. (NASDAQ:ISSC) today announced that the Company has entered into an agreement with the Triumph Group, Inc. to partner as an installation center for Innovative Solutions & Support’s (IS&S) Cockpit/IP® Flat Panel Display System (FPDS) for Classic Series Boeing 737 and 757/767 and its Integrated Standby Unit (ISU) at all of its locations throughout the world. BERWYN, Pa. – December 4, 2017 – Triumph Group, Inc. (NYSE: TGI) (“Triumph” or the “Company”) today announced that it intends to combine Aerospace Structures and Precision Components into one business unit, “Aerospace Structures,” effective January 1, 2018. Pete Wick, current Executive Vice President of Precision Components, will become Executive Vice President of the new combined Aerospace Structures business unit. BERWYN, Pa. – November 16, 2017 – Triumph Group, Inc. (NYSE:TGI) today announced that its Board of Directors has declared a regular quarterly dividend of $0.04 per share on its outstanding common stock. The dividend is payable December 15, 2017 to shareholders of record as of December 1, 2017. BERWYN, Pa.--(BUSINESS WIRE)--Nov. 8, 2017-- Triumph Group, Inc. (NYSE: TGI) (“Triumph” or the “Company”) today reported financial results for its second quarter of fiscal year 2018, which ended September 30, 2017. BERWYN, Pa. – November 6, 2017 – Triumph Group, Inc. (NYSE:TGI) announced today that its San Antonio based Product Support business was awarded a multi-year contract extension with Boeing to facilitate its ground support equipment (GSE) operation. Under the contract, Triumph will maintain ground support equipment at the San Antonio site to ensure reliability and availability of critical equipment needed to service aircraft on ground through June 2020. RED OAK, Texas--(BUSINESS WIRE)--Sep. 15, 2017-- Boeing [NYSE: BA] has selected Triumph Group, Inc.[NYSE:TGI] as a major supplier for its T-X Air Force training jet. If the Air Force awards the contract to Boeing, Triumph’s Aerospace Structures business unit, located in Red Oak, Texas, will supply the wing, vertical tail and horizontal tail structures, with opportunities for additional work, generating 950 direct and indirect jobs. BERWYN, Pa.--(BUSINESS WIRE)--Jan. 11, 2017-- Triumph Group, Inc. (NYSE: TGI) will release third quarter fiscal year 2017 earnings on February 2, 2017 and will host a conference call that day at 8:30 a.m. ET. A slide presentation will be included with the audio portion of the webcast. BERWYN, Pa.--(BUSINESS WIRE)--Jan. 30, 2017-- Triumph Group, Inc. (NYSE:TGI) was selected by Textron Aviation Inc. to supply aluminum machined parts for the new Cessna Citation Longitude super-midsize aircraft. Triumph Precision Components’ Complex High Speed Center of Excellence based in Wichita will produce the aluminum spars and wing skins for the Longitude program.